Members of the public were asked to nominate buildings that they felt are important to the community and are threatened with demolition or neglect. The purpose of this list is to channel resources and awareness toward those buildings and promote revitalization of older buildings. Losing these buildings to demolition or neglect would be a huge loss to local neighborhoods and to the city as a whole. Nominations were accepted for about a month and a committee of Rehabbers Club members made the final decision on which buildings would make the list. Members of the Des Moines Historical Society helped dig up some historical research on the buildings. 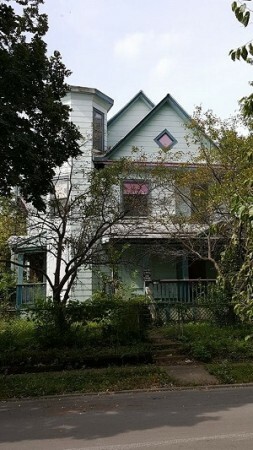 FEATURES: This Renaissance/Georgian style mixed-use commercial and residential building is in generally good condition. It is still in use as apartments and a music venue. 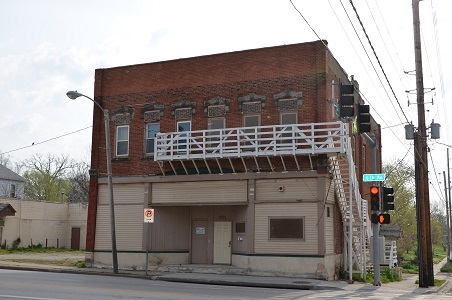 The current owner has assembled a large area of continuous parcels on the block, including this historic building. Questions regarding future plans have been answered with vague responses about not having immediate plans for any changes. There are no immediate plans for changes to the existing building and normal operations will continue,” Kum & Go Vice President of marketing and communication Megan Elfers said in an email to The Register. However, as construction proceeds on the new Kum & Go headquarters nearby, the company has been vague about plans for the structure. 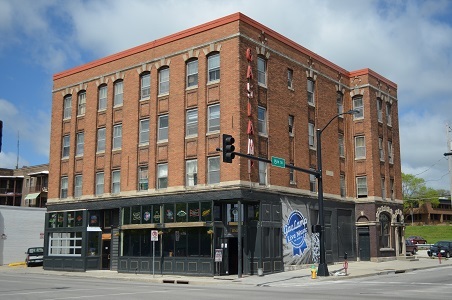 In 1999, the State Historic Preservation Office evaluated this building as potentially eligible for listing in the National Register of Historic Places under Criterion C as a good example of early 20th century residential/commercial design. It was also included in a 1976 survey of historic structures in Des Moines. Since the music venue and restaurant opened it has become a thriving addition to local nightlife in the Western Gateway area. The historic character of the building helps anchor one corner of the Pappajohn Sculpture Park and reflects the historic brick buildings present on the south side of Locust, across the Park. FEATURES: Streamlined Moderne theater architecture. Example of Depression-era theaters designed for sound movies (rather than older theaters that hosted the vaudeville circuit) and automobile-driving patrons. Original, metal, art deco theater marquee. Glazed ceramic brick and tile and exterior ticket window and two poster frames adorn the front. It shares a lot with the Greenwood Lounge, Manhattan Deli, and several other businesses, which contribute to its history as well. 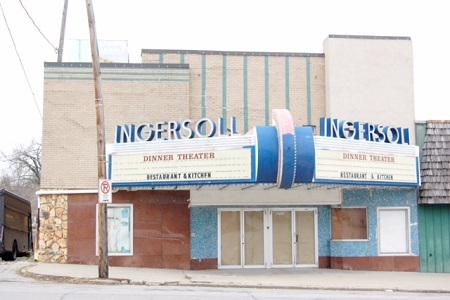 WHY IT’S ENDANGERED: After the Ingersoll Dinner Theater closed in 1989, the building was empty for a time and then housed a number of entertainment businesses that attracted crime and eventually failed. It has been vacant for several years and is in danger of neglect and vandalism. City staff have been working for several years to push the owners to make exterior improvements to the building. FEATURES: Victorian commercial architectural styling with two-story, rectangular configuration and hood molds over the windows. It was surveyed in 1994 as part of the “Towards a Greater Des Moines” reconnaissance survey of Des Moines’ Victorian suburbs. WHY IT’S ENDANGERED: It has sat vacant and at risk of deterioration and vandalism for several years. It does not seem the current owner has any plans for restoring the building. As property values along 6th Ave. increase as revitalization occurs, the property may be at risk of demolition in favor of new commercial development. The building is now part of the 6th Avenue Corridor revitalization and would contribute a great deal to the community by being restored as a public meeting space and location for local history to be celebrated. FEATURES: 2.5 story house with an octagonal canted bay, an attic balcony, and a complex roof design. It is architecturally significant as an example of Queen Anne style houses in Des Moines. 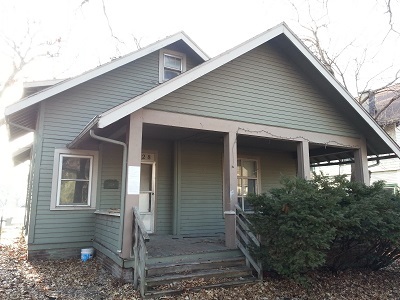 It closely resembles its sister at 1730 7th St., identical in many respects, in ground plan. This strong resemblance suggests attribution to the same architect or contractor-builder, although the name has not yet been identified. The design at 1720 is a bit more complex, however, including the canted bay windows with octagonal shape rather than rectangular, and the inclusion of an attic balcony. This house is eligible for nomination to the National Register as a rare surviving example of an important architectural subtype of Des Moines early suburban architecture. As other houses of similar age on the same block have been restored, this house stands out as what could be a beautiful home connecting the restoration all along the block. It would elevate the quality of the surrounding block substantially if this house were cared for. 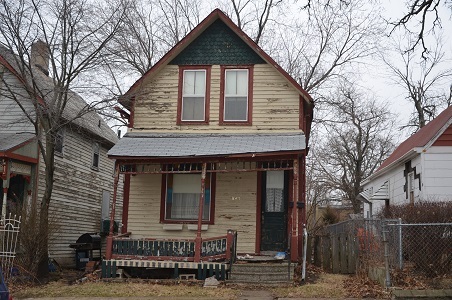 ADDRESS: 845 & 847 17th St.
WHY THEY’RE ENDANGERED: These houses have deteriorated drastically over the last ten years. A neglectful owner has failed to make repairs to the exterior, including damage to the roof, peeling paint, and damaged front porches. ADDRESS: 1628 E. 8th St. FEATURES: Craftsman Bungalow with Victorian first floor interior layout. Upper level was destroyed by fire in the 1930s and re-built with an open floor plan and dormer windows. WHY IT’S ENDANGERED: This building suffered a slumlord owner through the 80s and 90s and has been sitting abandoned after a failed contract sale in the 2010s. It needs some major renovation work, structurally and aesthetically. The kitchen was gutted by a previous owner, revealing water damage from a leaky sink. The upstairs may have been an apartment at one time. Remnants of a former kitchen still exist on the second floor over the kitchen. Two full baths need major renovation. The foundation of the building is badly slanted and the house needs to be jacked up and leveled with a new foundation built underneath. WHY IT’S IMPORTANT TO SAVE: This home was built by Voltaire Payne Twombly, a Civil War hero and recipient of the Medal of Honor. Twombly would go on to found Hawkeye Bank in Des Moines and serve as the State Treasurer for many years. Twombly comes from a notable family. His father was a utopian community builder who started a village in southeast Iowa according to Enlightenment principles. Census records and local history resources show that the Twombly family owned the building until the granddaughter of Voltaire Twombly sold it in the 1960s or 70s. The home could be a very comfortable place for a family, with space for four bedrooms, two full baths, and a garage. ADDRESS: 120 E. Fifth St. FEATURES: The 1,682-square-foot, rectangular building, designed with Dutch architectural influences, is brick with a gabled roof. WHY IT’S ENDANGERED: The integrity of the building has not been maintained; it is boarded up. It has suffered a fire and continued neglect could destroy it. WHY IT’S IMPORTANT TO SAVE: The building was constructed as a railway depot. After a period of time – anywhere from four to 20 years, according to local sources – the building was converted into a storage facility. The Polk County assessor’s office says the building was converted to a “cooler” sometime in the 1950s. It’s a structure of uncommon quality that deserves a second chance. 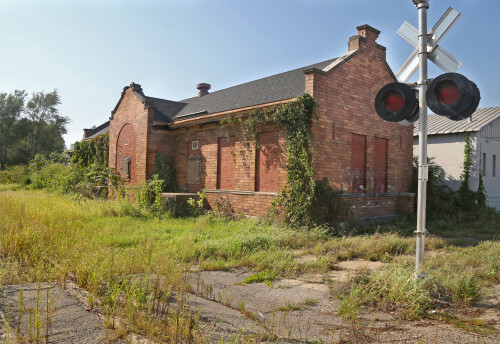 It is one of two known passenger depots still standing in Des Moines and the only one on the east side. The other was renovated and now is home to the Hessen Haus restaurant at 101 Fourth St. With the burgeoning development of the southern part of the Historic East Village, this building could be re-purposed as a restaurant, retail shop, or even a visitor center. 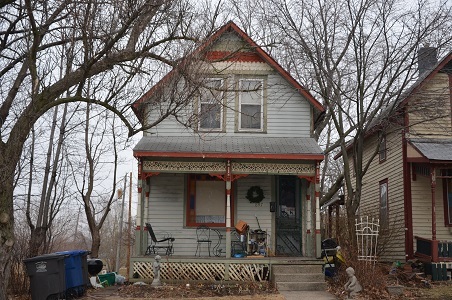 The mission of the Des Moines Rehabbers Club is to promote neighborhood revitalization and restoration of Des Moines’ unique building stock by informing, educating, inspiring, and supporting each other in all phases of renovation and maintenance. Some of the ways we can help include identifying funding sources for repairs, connecting you with contractors and experts who respect older buildings and can help plan the renovation process with you, and offering a connection to those who value your building as a vital part of their community. Buildings that have been listed on our Most Endangered List in the past include the Kingsway Kathedral, the Whittier School, and Don’s Service Station. All of these buildings have found a new lease on life because neighbors in the community joined together to find the right solutions. We hope we can help your building be a success story in the future as well.